Taking influence from cartoonesque storyboards and the work of David Hockney, Alvestad’s paintings full of colour and movement: a tap running in the kitchen, steam rising from a car engine, a man swinging an axe, even when the characters are sitting, there is a sense some action or drama having happened moments before. In one painting, for example, a man is sitting in an armchair in a room full of plants, there’s a wine bottle on the table and an ashtray with two stubbed out cigarettes. One of his hands is raised in an ambiguous gesture — we wonder whether he’s speaking to someone out of sight or whether the gesture is one of resignation. 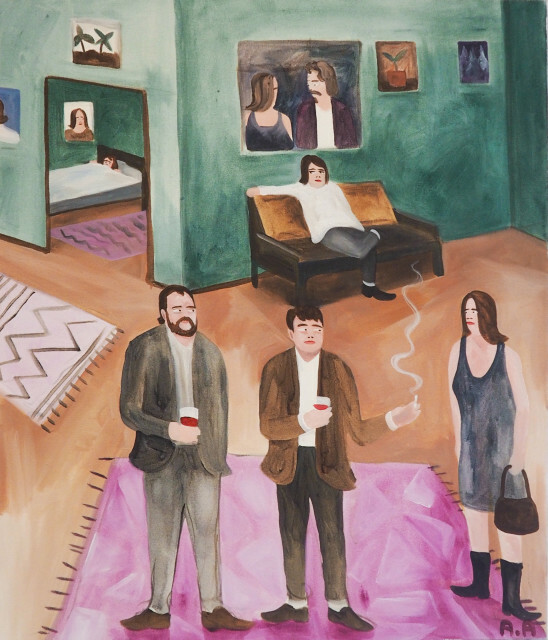 In all of the paintings, the characters, whether male or female, are similar in appearance with their pink skin, brown hair and boxy silhouettes, and as such, they function more as archetypes than individuals, both allowing the viewer to freely interpret the scenes and also emphasising familiarity; these are interactions that might be universally recognised. This is most apparent in the painting of the man and woman lying next to each other in bed reading. On a first glance, this appears to be a cosy scene, but on closer inspection, we might notice that the characters’ mouths are downturned, mirroring the painting of the sagging palm-tree hanging on the wall and in an almost depressing contrast to the loud cheerfulness of the pink zig-zagged wallpaper. Similarly, another painting shows a man presenting a woman with a bunch of flowers, but the romantic gesture is turned tragic and humiliating by the collection of vases dotted around the room and filled with identical looking bunches. In this way, the paintings swing between comedy and tragedy; we get the sense that we’re not supposed to take these scenes too seriously and yet, it’s impossible not to empathise with the obvious humanity that they express. The exhibition’s title itself functions both as a joke and an expression of a stubborn instinct or perhaps, even some innate destructive desire. This, again, points to an underlying tension in the work, but also to something inherently contradictory in human nature, which we might identify in the paintings’ characters. Indeed, the works provoke an urge to search and find. In the same way that we are encouraged to actively look for clues in a mystery, the viewer pieces together the visual representations in order to create new meaning that might transcend the image on the canvas. As such, we’re invited to not only glimpse the artist’s creative process, but to also become an active part of that process, a continuation. In this way, time and action come to the forefront of these artworks. Whilst we are aware that each scene depicts a single moment, we are not to believe they exist in a bubble; there are visible traces of the past and glimpses of the future. In the painting of a man licking a frog by a pool in a forest, for instance, we might wonder where he’s appeared from, has he been chased? Perhaps by the men in coats with a head-torch from another painting? What will happen now? And what can’t we see? What’s hiding beyond the confines of the canvas? We are continually captivated and drawn into worlds that are as mysterious as they are familiar.